For this Flashback Friday we have some pins not released for Halloween, but it certainly deserving of mention in the 13 Creepy, Kooky, Spooky Jessica Rabbit Halloween Pins countdown. 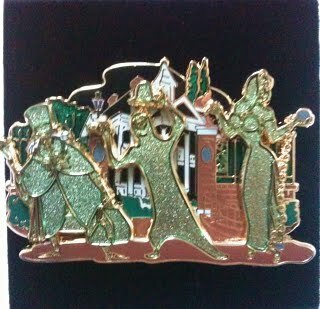 This first one is a Walt Disney Imagineer Exclusive limited edition pin featuring the Haunted Mansion Hitchhiking Ghosts. However, the third Hitchhiking Ghost, Gus, has been replaced by a different character - GHOST JESSICA RABBIT! What a glamour ghoul. Jessica Rabbit might be too scared to take a plunge on The Twilight Zone Tower of Terror. Or perhaps she just exited the ride. 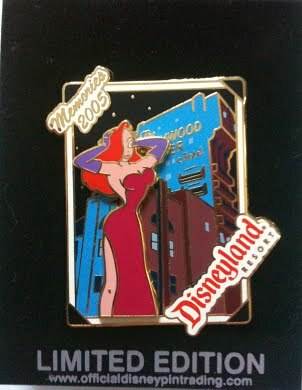 In this pin we see quite a shocked Jessica Rabbit, who is holding her head in her hands with eyes wide as she overlooks The Tower of Terror. This pin was a Walt Disney Imagineer Exclusive. 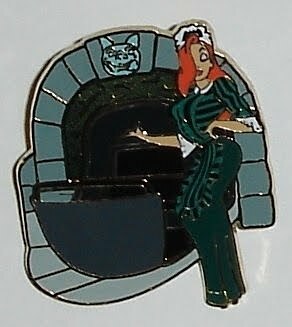 Jessica Rabbit is dressed as a maid from The Haunted Mansion in a dark green dress with apron and white hat, and is in the Haunted Mansion catacombs next to the ride vehicle, the doombuggy. Hurry Back!